LAWRENCE — Combining various trademarks of Molière’s plays and making the story more accessible to modern American audiences, professor and chair of theatre Mechele Leon crafted a four-act evening of hilarity with “The Rehearsal & The Hypochondriac.” The University Theatre at KU will open this zany comedy on Feb. 26. Performances are at 7:30 p.m. Feb. 26-27 and March 3-4 as well as at 2:30 p.m. Feb. 28 and March 6 at the Crafton-Preyer Theatre in Murphy Hall. 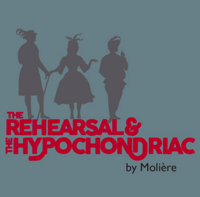 The production begins with Molière gathering his company in a theatre at Versailles for a last-minute rehearsal before the arrival of King Louis XIV. The company members, like all actors, are playful and distracted and would rather improvise a new play and horse around than rehearse the one at hand. With the arrival of the king, they transform into the theatrical professionals they are and perform. Leon composed a new finale with original lyrics that poke fun at today’s parade of funny-sounding prescription medications. Former theatre student Michael Wysong wrote the music, and Theatre Professor Leslie Bennett choreographed. This production is the adaptation of Molière’s “Impromptu at Versailles” from 1663 and “The Imaginary Invalid” from 1673. The company includes Adrian Brothers, Lawrence senior, as Moliere and Argan; Michelle Cowles, Overland Park sophomore, as Genevieve and Prompter; Rendi Doran, Olathe sophomore, as Madeline and Toinette; Stephen Elberg, Weston, Florida, freshman, as King’s Page and Florant; Sam Foreman, Leavenworth sophomore, as Marie and Bonnefoy; Joe Lilek, Bethesda, Maryland, senior, as Brecourt and Thomas; Chris Martin, Ephrata, Pennsylvania, doctoral student, as assistant director and dramaturg; Christoph Nevins, Overland Park senior, as LaGrange and Cleante; Josh Philoon, Wilmette, Illinois, sophomore, as DuCroisy and Purgon; Katie Sgroi, Prairie Village freshman, as stage manager; Abby Sharp, Rossville junior, as Armande and Angelique; Kevin Siess, Lawrence senior, as Bejart and Beralde; Abigail Smith, Parsons sophomore, as Therese and Beline; Marit Sosnoff, Chesterfield, Missouri, freshman, as Catherine and Louise; and Graham Wells, Overland Park junior, as Thorilliere and Diafoirus. The production also features Dennis Christilles, associate professor of theatre and University Theatre artistic director, as lighting designer; Sandy Leppin, Lenexa guest artist, as scenic designer; and Shannon Smith-Regnier, Kansas City guest artist, as costume designer. Tickets for “The Rehearsal & The Hypochondriac” are on sale now at KU ticket offices and online at www.kutheatre.com. Tickets are also available by calling the University Theatre, (785) 864-3982, and the Lied Center, (785) 864-ARTS. Tickets are $18 for adults, $17 for senior citizens and KU faculty and staff, and $10 for children. KU student tickets are $10 in advance, $15 at the door.